Hope you have a day filled with sunshine, too! Is it because it's dark, Peter? Good mAen, good people. First Fridays for us this year have been 'bless and be blessed' ministry days. Feeling overwhelmed and grateful! Another wonder: It is Visa from Varsity's birthday. Is Varsity a location, or a school sports team? Happy Birthday, Visa, in either case! all. 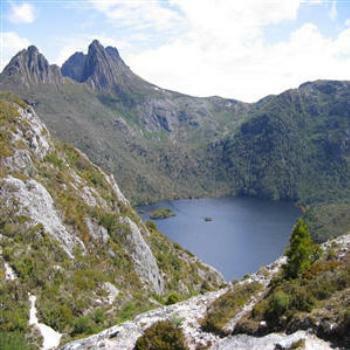 This must be the lake on the other side of yesterday's photo- Cradle Mountain. Pretty lake in the mountains. Morning all, wish it hadn't been raining when we tried to go to Dove lake. She's definitely not ready to go back to work yet. Speaking of work ... 22 is upcoming but a cp will only take me to the brink. So I will leave it here at 20. A nice set up for Keith et alia. Here is Saturday's 3&4 poozle. Sorry about the failure to line up column E, but I.m sure you will cope. Ah. I see Keith made it back just in time. All is well. I couldn't resist using Wombat's puzzle as an excuse to continue to relax. Iv sent my answers in. I just can't seem to sustain effort any more today I've done a few loads of laundry and stared into the depths of the fridge, but other than that ... not much since awakening from my nap. Now to overlook my typing (or tapping) errors and recharge my poor phone with the battery that needs replacing because it can't hold a charge for more than half a day. It's 8C here at the moment but feels like 4C. Supposed to be 12C max. but won't reach that. It's been pouring and windy all night and all morning. We've had similar weather all week. But hey! It's winter!! We had snow on Bluff Knoll on the Stirling Ranges (where I took Kathy & Jane to see) yesterday and should be some today, too. New home inspection tomorrow. I am off to bed so I can get up and look for paperwork before I go. Interesting! When I first entered I was logged in but my Xed places were all wrong. I clicked 'No animated ads' but I still had an animated ad. I turned on it's sound and it was a man talking. I clicked the ad off but the talking continued anyway so I clicked refresh and everything went back to normal, x's OK and ad gone. Anyone else have a similar experience today? DotCom, did you correct the x's before you refreshed? If so, the refresh would have picked up your new settings. If not, that is very interesting indeed! Discarded settings generally means your sudoku cookie hasn't been loaded. I always assumed I had saved so many games the size had become unmanageable, but your observation puts a new spin on it. I will be watching more closely in future.